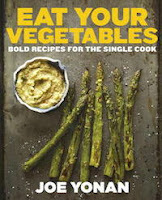 So many wonderful vegetable and vegetarian cookbooks have come out recently, it’s hard to keep track of all of them. I wrote about many of my favorite vegetable cookbooks in April, here are some more perfect for starting the new year. Note: a couple of these are not strictly vegetarian, but have so many great vegetable recipes I included them anyway. For a food writer and editor to go vegetarian, means some really serious work had to happen, adapting and creating new bold recipes. That’s exactly what Joe Yonan has done in his latest book, Eat Your Vegetables. It’s the second in a series for the single cook/diner. But if you are not single, don’t let that deter you. First of all there are times when all of us are dining alone, and most of the recipes are easy to multiply or adapt for larger groups. This is vegetarian food for someone who knows how meat tastes, if that makes any sense. Curried Mushroom Bean Burgers, Pomegranate-Glazed Eggplant, Spaghetti with Root-to-Leaf Radish. Good stuff! 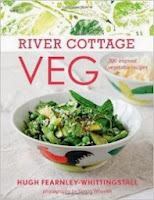 River Cottage Veg is the latest in a series of River Cottage cookbooks on single subjects, everything from fish to preserves to bread. The book has some classics like Eggplant Parmigiana and Poached Egg on Toast, but also very fresh vegetarian recipes, like Warm Salad of Mushrooms and Roasted Squash, Beet and Walnut Hummus, Tahini-dressed Zucchini and Green Bean Salad, Green Onion Galette and Kohlrahbi “carpaccio.” It’s simple but very appealing and approachable vegetarian food for vegetarians and non-vegetarians alike. 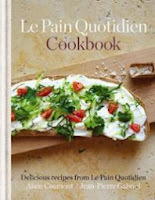 Le Pain Quotidien is a book that seems to have remained under the radar. I didn’t see it on one “best of” list this year. But with 200 bakery/cafe locations around the world, you know they are doing something right. And they are. Le Pain Quotidien makes delicious, mostly organic, and often healthy food including lots of open face “tartine” sandwiches, soups and salads, breads and more. The cookbook is an extension of the brand, in the best possible way. There are some very unexpected but enticing recipes like Mocha & Caper Butter with Crostini, Pea, Pancetta & Radish Tartine, Soba, Cauliflower & Blood Orange Salad and Pearl Barley Paella. The photography is beautiful and the recipes are all really straight forward and easy to do. You can create lovely little picture perfect snacks with this book. 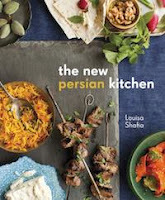 The New Persian Kitchen isn’t a vegetarian cookbook, but the majority of the recipes just happen to be vegetarian. They are also exotic, often healthy and very approachable, though not strictly traditional Persian. The book pleasantly surprises with new-to-me ways to prepare things like Roasted Stuffed Artichokes with Mint Oil, Radish, Rhubarb and Strawberry Salad, No-Bake Persimmon and Goat Cheese Cheesecake and Fig Mustard. I became a big fan of Louisa Shafia after reading her first book, Lucid Food and am happy to add this one to my collection. 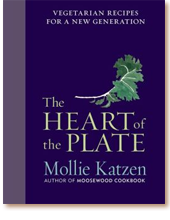 The Heart of the Plate is Mollie Katzen’s latest cookbook. If you loved the Moosewood Cookbook, this is a much more modern book. Though I prefer the illustrations over the somewhat boring photos in this book, the recipes themselves are bound to become classics. Her twists, like adding pomegranate to tabouli in Pomegranate Tabouli, adding to quinoa to pancakes in Tiny Quinoa-Speckled Buttermilk Cornmeal Cakes, Bulgur and Spaghetti and Kale Caesar Salad are genius! Another keeper.